Before any work could be done on the lawn project I had to figure where I would put the soil after digging it out to allow the cobbles to be laid. Some of the soil would be replaced once the grass had been removed from it. I decided the only suitable place to store it would be where the second bag of sand had been placed. I had removed the sand from the cellar floor whilst constructing the pit in there (see earlier posts). That meant I had to put the sand into small bags and store it in the garage as I had done with the first large bag. Some of that sand has since been used but there was still a large amount unused. I spent some time on Thursday afternoon and Friday morning re-bagging and removing the sand from outside. …and putting it into the garage with the rest…. It may not seem a lot but there are seventeen bags there in the picture above with two more behind the wheelbarrow.There are also bags of grit, granite chippings and cement there too! The garage is getting quite cluttered as you can see from these pictures…. On Wednesday morning and having no scheduled electrical work yet again I set about making preparations in readiness for laying concrete in the next day or so. The original steps behind the newest of the garages require a complete reconstruction (see picture in yesterday’s post) so I had to make some wooden shuttering which will outline the position of the new steps. This work has to be done in stages of course because all of the concrete cannot be laid in one go to produce the finished effect. As it happens it is the new middle section that needs to be done first followed by the top section and later the lowest section which I propose to extend as more of a raised platform rather than a short step in order to improve the existing poor stonework that makes up the current pathway whilst at the same time burying the top half of a waste pipe which should have been done when work in this passageway was undertaken by the previous owner of the house some twenty-six years or more ago. It is one of those areas we haven’t much bothered with since we took possession of the property twenty-five years ago this summer. There have been many other projects to do since that time so this particular project kept on being overlooked. So now I have no excuses for not starting the work and it will vastly improve the rear access from and to the garage. It is an awkward area to work on simply because it is the only access to the garage from the rear garden but now that access will have to be closed whilst I carry on with the work. There is more work to be done further down the pathway but that won’t hinder access to the garage. I am looking forward to doing the work as many of my regular readers will already know that I like working on projects at home. Whilst there is no hurry to get it all done I won’t be dragging my feet, I want to see it finished myself! If and when I get electrical work that will take precedence of course but I can take time off as and when I wish. Fortunately with this particular project I shall not need to worry about the weather as the job is under the cover of the garage roof. Not so with the work I want to do behind the other garage though, for that I will need dry weather for a day or so. 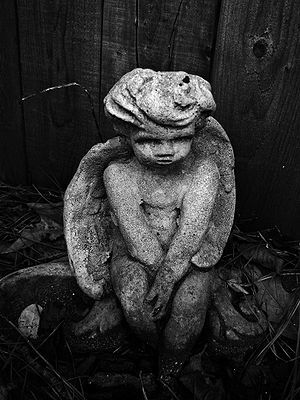 I could end up looking like the dirty concrete cupid in the picture! Yesterday was another glorious day here on the north-west coast at Southport. Weather for sitting around in and relaxing but I had to do the work I promised I would do the day before. The garage electrical circuits are now all fully functioning. E took me to a local store to purchase a light fitting for the roof above the rear steps as we had forgotten to buy it the day before. I also diverted the supply to the floodlight on the garage front so that it, along with everything else in and around the garage would be supplied by the garage distribution board. After I had completed that work I set about fixing some wooden battens over the rear access to the storage area which is inside the garage but above the rear steps to the garage. I need to make this opening secure by fitting some heavy-duty plywood over the hole. I have a small job to do for someone this morning so I will have to continue with the garage later. I also have to fit the woodwork for the roller door’s metal guides on each side of the garage opening and the newly cleaned and painted brackets need to be replaced on the wall. I didn’t finish working until 6.30 last night after starting at 9.30 in the morning so I was glad for the rest but I’m ready to start again today! It looks like we are in for some more fine weather this weekend so maybe a barbie is on the cards? Must remember to get some charcoal though! I was up and out working at 8 o’clock yesterday morning. I had rested all day Saturday so was ready to do something. The main jobs were to remove the bricks and then the stones that had been stored in the garage but first of all, where to put them? I had it in mind to store them on the concrete platform that stands behind the old garage but first I had to remove some garden furniture and other things that had been left there. Using a wheelbarrow I proceeded to remove the bricks and re-stack them on the concrete platform. This took me over an hour of continuous labour. The next hour was spent shifting the stones and re-arranging the other items stored on the platform. At last! I could see the garage floor! By this time E had come outside to help. She was applying wood preserver to the parts of the new partition wall that had not yet been done and also some spare plywood sheets. Meanwhile I fitted some skirting boards and architraves to the partition wall which is now complete. There was quite a lot of off-cuts of wood as well as old wood pieces that needed to be removed and burned. This was my next job. In the past, before we had a vegetable plot, the area was used to burn large amounts of old wood, tree branches and the like but now the area has been landscaped and planted so we have to burn the wood elsewhere. We have an old metal waste bin that we use for burning wood now. It has holes in the base thus allowing an air up-draught, perfect for burning. However, with such a large amount of wood, including some old branches we found in the garage, it was necessary to stay with the fire to both feed it and to make sure the fire remained safe. By the time the wood had burned a couple of hours had passed by and I was beginning to smell of wood smoke! It was around 4.30 when I decided I’d had enough and went back indoors both to rest and to get washed and changed. There is always another day. The garage is looking more like a garage now although there is still much to do yet. Today I shall be making a start on clearing out the garage of bricks (we have a few hundred stacked there) and many large natural stones which we accumulated when we knocked down the dry-stone walling at the front of the house some weeks ago. If you remember (those who read my meanderings) we had a brick wall built in its place. Anyway these need a new home, probably either inside the other garage at the rear where there is ample space or at the rear but outside on a large concrete platform which is there behind the garage. Then there are the several sheets of plywood which need treating with preserver before being stored alongside existing sheets of plywood in the other garage too. If anyone wants to build a shed using plywood we have plenty of it! A few other things will need to be disposed of too then I can sweep the floor and get on with treating the roof timbers and finishing off the electrical work and the remainder of the woodwork around the new partition wall. I’ve plenty of time on my hands these days so I am not bothered by the amount of work that needs to be done.